We helped promote brand awareness for Method and Sephora during the 2018 Coachella Valley Music and Arts Festival. The Coachella Valley Music and Arts Festival is an enormous celebration of art and music, and provides a colorful backdrop for commercial brands to promote their products. Many companies deck out tents, within festivalgoers are immersed into an exhilarating interactive marketing experience. It was our honor to join forces with the cutting edge experiential agency Revolution Marketing and bring to life their brand activations at the famed festival in Indio, California. 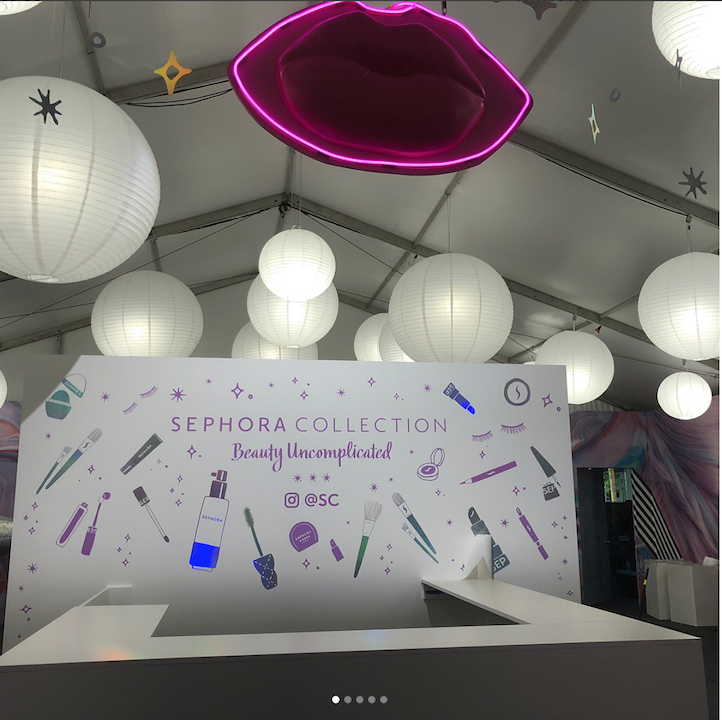 The epic beauty retailer Sephora asked to outfit their tent with glitter and glam as they offered full-service hairstyling, makeup, and fun temporary hair coloring for festivalgoers while promoting their multi-brand retail business in addition to their own line of makeup, fragrance and styling products. From counter and wall fabrication, to large-scale graphics, lighted mirrors, suspended lips, and glitter-clad-larger-than-life makeup and hair accessory props, we were involved in nearly everything showcased inside the tent. The glitter covered props became a huge hit as festivalgoers snapped pictures with them and uploaded the shots to their social media accounts further promoting the Sephora Brand. Soon everyone was coming by the tent just to be “glitterized”. Check out this video below from Sephora's Instagram. Many of us are aware of the household name Method, the benefit-corporation with environmentally conscience cleaning products for both the body and the home. To help promote their products through social media, they came up with a great interactive photo-op experience for festivalgoers to upload to their personal accounts thereby spreading the word about Method in a fun and “bubbly” way. We helped Method produce a branded photo booth complete with over-sized acrylic bubbles which contained a line of several cameras that simultaneously took shots of the participants inside. The images were put together in a gif outlined with a sleek Method frame, and festivalgoers were able to upload the gif to their social media accounts. If you are looking to promote your brand at an event through interactive marketing, give us a call with your ideas and let our team of designers and fabricators bring your brand experience to life.